Wasted Love Songs is brilliantly easy on the ears, but once the emotional payload is delivered, it’s anything but an easy listen. And “wasted?” Not hardly. 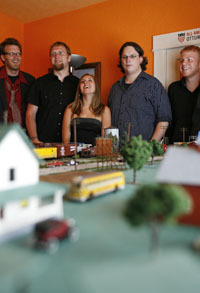 She Swings, She Sways..an amazing folk band from Ottumwa, Iowa..new album “Wasted Love Songs” out now. From the home of Radar O’Reilly, Ottumwa, Iowa, comes She Swings, She Sways, an interesting Americana sextet you need to know a little more about. She Swings, She Sways has a very homey feel, like music you might play with friends sitting around a kitchen table on a Saturday night. It’s that at home feel that lends much of the charm to the band’s full length debut, Wasted Love Songs. Each band member contributed to the subject matter here. Stories of love lost or unrequited in the voice of Midwest sensibility and caution reach a crescendo of melancholy that approaches beauty. She Swings, She Sways tells their stories. She Swings, She Sways’ range of influences is wide, combining rocking two-beat stomp, soulful lovelorn lyrics, & lilting pop melodies.